Parviz Etessam, age 91, passed away peacefully in his home on Wednesday, April 5, 2017 surrounded by family and friends. Parviz was a loving husband to Parvin for over 70 years. His children, Shahin, Mitra and Ali and four grand children each respected and admired Parviz’s strength, wisdom and courage. Parviz was a talented engineer as well as a linguist who was fluent in Russian, English and Farsi. He traveled to many places in Europe and the Middle East for his work and served not only as an oil engineering expert, but as a respected translator and technical consultant as well. Parviz was a strong man who was a competitive boxer in his youth, but his ready laugh and warm smile were as striking as his strength. His boisterous laugh and kind eyes lit up a room and his generous and warm heart touched all who knew him. 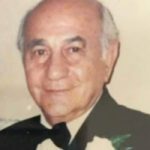 Although Parviz struggled with Alzheimer’s and other health concerns in his later years, his loving spirit and inner strength were never wavering. Shahin, my deepest sympathy to you and your family for you loss. Sounds like he was an amazing man and you are fortunate to have been blessed with him for so many years. Sending you prayers for peace and comfort. With my saddened heart I send my deepest condolences to you all, and I hold you all close in my heart and the memories of our wonderful Mr. Parviz Etessam whose heart was always open, filled with love and joy, delighting everyone who came on his path. Our sincere condolences to you and your family at this time of sorrow. We are deeply saddened by the loss of your father, Parviz. Our thoughts and prayers are with you and your family.